210 pages | 8 B/W Illus. "This is the first and most systematic theoretical and empirical study of (trans)national agrarian movements from the perspective of human rights. Brilliant. It changes the boundary of how we understand and study (trans)national agrarian movements." – Jun Borras, International Institute of Social Studies, Netherlands. "This is a uniquely well informed and lucid discussion of how one of the most innovative social movements of this century has been gradually transforming our understanding of human rights in general, and of the right to food in particular. Priscilla Claeys provides a contribution both to the sociology of social movements and to the history of ideas, and she offers a rich discussion of how peasants' rights are emerging in human rights law. This book is three books at once: a significant achievement." – Olivier De Schutter, University of Louvain (UCL), Belgium, and former UN Special Rapporteur on the right to food (2008-2014). "The book is groundbreaking, interesting, impressive, original and solid academic work. It is a significant contribution to our understanding of the politically relevant human rights dimensions of current agrarian movement struggles. 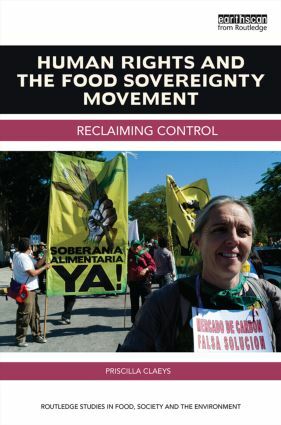 It will, no doubt, prompt some lively debate particularly around the concept of the 'right to food sovereignty' and La Vía Campesina’s broader social and political transformational framework of 'food sovereignty'." – Annette Aurélie Desmarais, Canada Research Chair in Human Rights, Social Justice and Food Sovereignty, University of Manitoba, Canada. "Claeys brings a unique experience and legal eye to the food sovereignty movement’s development of a politics of human rights for the food question of our times. In recounting the movement’s philosophical and political trajectory, she critically evaluates how a small-producer based movement can make its presence and claims felt in raising the possibility of alternative, sustainable paths to the future. As such it is a singularly consequential contribution." – Philip McMichael, Cornell University, USA. "This intriguing study of the creation of food sovereignty as a human right provides valuable insight into how social movements are translated into human rights terms and the complicated social and cultural interactions between local and global understandings inherent in the translation process." – Sally Engle Merry, New York University, USA. "On a methodological level, Priscilla Claeys’ book shows that conducting a global, multi-site and multi-scale research is not only possible but indispensable to understand actors, claims, debates and tensions that articulate global, national and local dimensions. On an analytical level, it shows how the use of global rights may contribute to new paths of emancipation that are emerging in less statist, less individualist and more plural ways." – Geoffrey Pleyers, University of Louvain / EHESS, Belgium and Research Committee 47 "Social movements" of the International Sociological Association.